As the resident bad-back in the office, Sciblogs editor Peter Griffin suggested I give the Upright Go a whirl, the latest health wearable that tries to improve your posture by vibrating every time you slouch. You attach the tiny device to your upper back using long-lasting adhesive strips that are supposed to last several weeks. Mine lost stickiness after just a couple of days, but I wasn’t using the supplied alcohol rubs before attaching it, and I certainly wasn’t fussed about ensuring I placed the device in its travel pack when I wasn’t using it. Before using the Upright Go, you’re asked to input metrics like height, weight and how good you think your posture already is. Then every day when you start using the Upright Go, you have to calibrate it to what you think an upright posture is — which I think is the biggest downfall of the device. If you’re turning to a device to fix your hunch, you might not have a clear idea about what good posture feels like in your body. The training itself seems relatively straightforward and there are only two modes on the Upright Go: training and tracking. Each day you are set different training durations which slowly amp up in length and frequency. The first day is a single session of eight minutes, but by day five you should be doing two sessions of ten minutes. While in training mode, the device vibrates every time you stray too far from your designated upright position. Annoying yes, but effective. 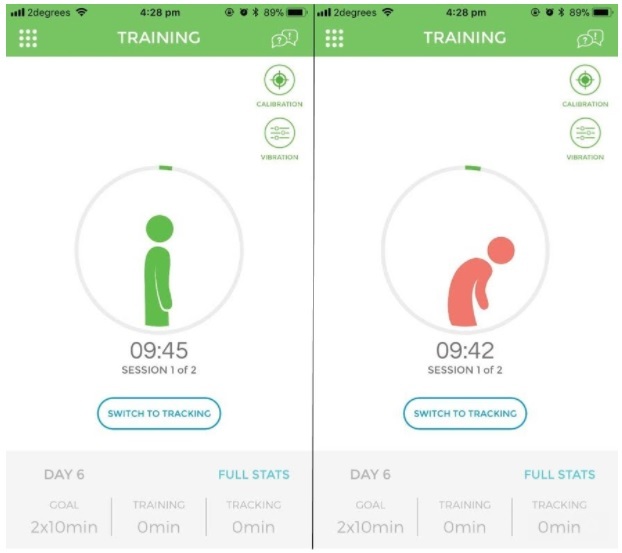 The accompanying app encourages you to spend most of your time in the non-vibrating tracking mode (so as not to overexert yourself) which simply records your posture over the day. While the device vibrates when you are slouching too much, the app shows you a helpful lurching cartoon. Despite my back issues, I had rated my posture pretty highly in the beginning as it’s something I already consciously work on. I was surprised to find that I was still slumping or off-kilter for about half the day — and this when I’m already primed to think about posture. Being able to see slumping stats from the whole day was really helpful and it did encourage me to change my behaviour (and not just when in training mode). 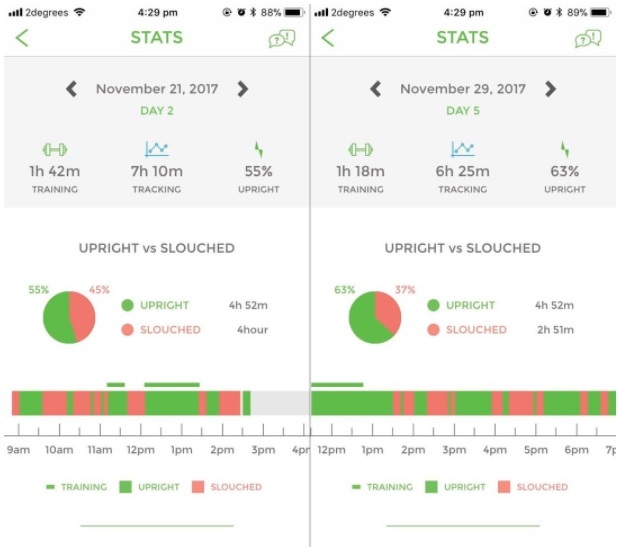 But I found that days I was tired (and therefore more likely to slump) I would opt not to wear the Upright Go, so as not to negatively affect my perceived score. From that, I can see this being a great device for those dedicated to improving their posture. Even though I have a vested interest in attaining better posture, I can’t imagine using this myself, so I can’t see it helping someone with just a passing interest. Before anyone starts training with the Upright Go, I’d recommend first going to see a physio or occupational therapist to find out what a healthy upright position is for you. Otherwise, you’re likely to spend a long time ‘improving your posture’ only to find you’ve just triggered a different problem.